Top left: common loon in winter plumage. Right: breeding plumage. Photos by Mike Yip. 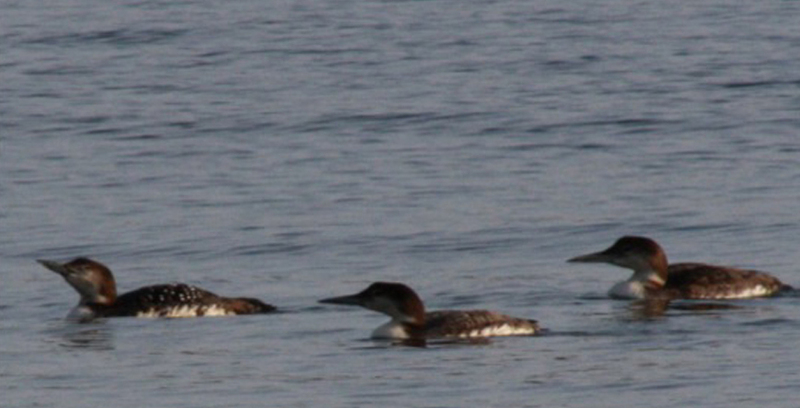 Bottom left: ​juvenile common loons at West Beach, Calvert Island, photographed by Maria Shallard. The common loon is a fairly large waterbird with a large, 'dagger-like' bill, red eyes, a long body, and a short tail behind which its legs trail when in flight. It is often seen diving for food. It is most distinguishable when in summer breeding plumage. This plumage consists of a dark head, neck, and bill, with a patch of white stripes around the back of the neck, a smaller patch just under the throat, and white squares and spots across its dark back. The species is less easy to identify in juvenile and adult winter plumage. In both cases the bird has a plain grey back, head, and back of neck, with white on the throat and a lighter grey bill. Juveniles have some scalloping on their back. 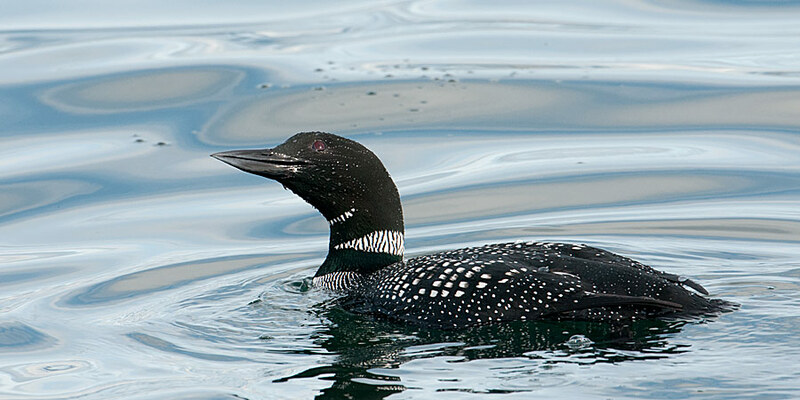 The sounds of the common loon are distinct and familiar to many Canadians. In particular, the tremelo and wail calls can be heard echoing across lakes and wetlands throughout the country. Click here to listen. The common loon spends winters mostly on nearshore waters along the east and west coasts of North America, as well as some lakes that don't freeze over. In the summer it can be found throughout most of Canada other than a few northernmost areas of the country. Its summer habitat is mainly lakes and ponds in forested areas and on open tundra. In juvenile and winter plumage the common loon can easily be mistaken for the Pacific loon (Gavia pacifica) or the red-throated loon. The common loon has a larger head and feet than both species, and is larger and stockier overall. The yellow-billed loon has very similar plumage in winter and when breeding, but its pale yellow bill sets it apart from the common loon. The common loon is somewhat of a national icon in Canada: it is depicted on Canadian one-dollar coins, leading to the coin's name of 'loonie.' 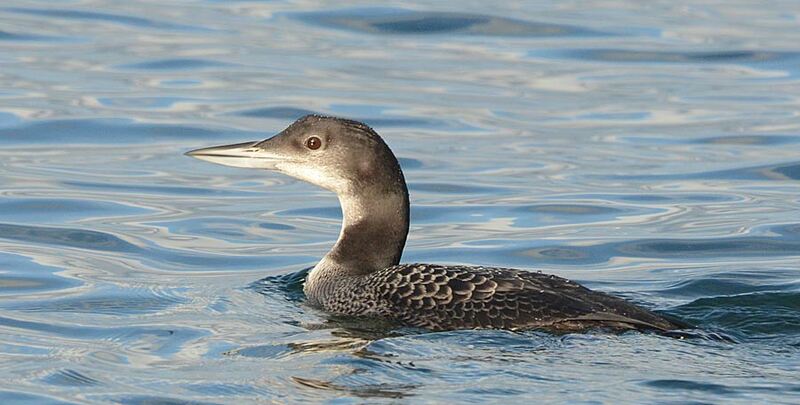 It is the provincial bird of Ontario, which has thousands of lakes and wetlands where the common loon is found. 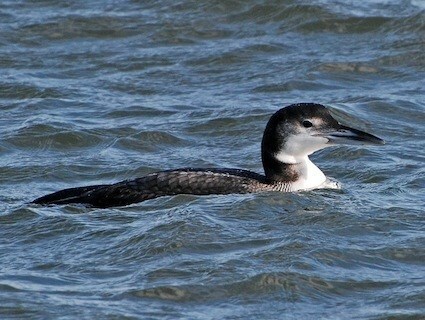 Common Loon Gavia immer. Audubon Birds. National Audubon Society. Accessed 24/03/2015. 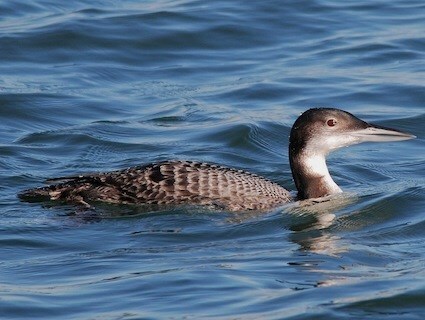 Common Loon (Gavia immer). The Birds of North America Online (A. Poole, Ed.). Ithaca: Cornell Lab of Ornithology; Retrieved from the Birds of North America Online. Accessed 03/01/2013. Dunn, J. L. and Alderfer, J. (Eds.). (2006). National Geographic Field Guide to the Birds of North America. (5th Ed.). Washington, D.C.: National Geographic Society. Pp. 72-73.